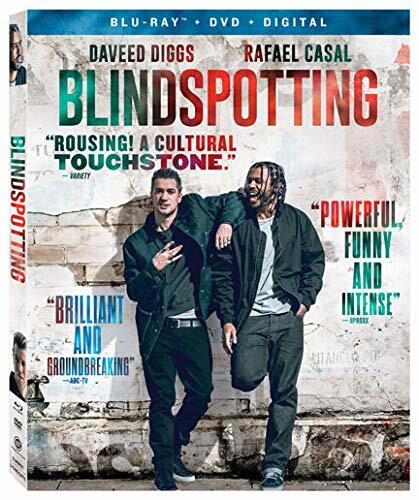 “Blindspotting” (2018, Lionsgate) Stars Daveed Diggs and Rafael Casal, who also co-wrote this ambitious film, are hot-and-cold friends trying to stay out of trouble in Oakland, which is depicted as a landscape of thinly veiled traps to ensnare young men – primarily African-Americans, but also lower-income guys with few economic prospects. Issues of gentrification and racial perception are also tackled along the way to a showdown over a police shooting; the latter conflict shoulders the most emotional freight, while Diggs and Casal hold down the humorous aspects; director Carlos Lopez Estrada dovetails too often to opine on other topics (like the insidious spread of hipsters), which waters down both the tension and the laughs, but when “Blindspotting” works, it’s that rare synthesis of a clever, entertaining feature with the scope and skill to address thorny social issues without pure polemics. 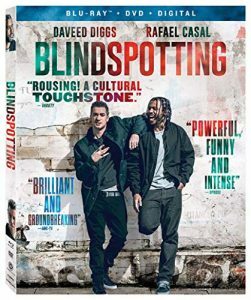 Lionsgate’s Blu-ray includes commentary by Estrada, Diggs and Casal, a making-of featurette and Estrada’s “director’s diary,” shot on his phone. 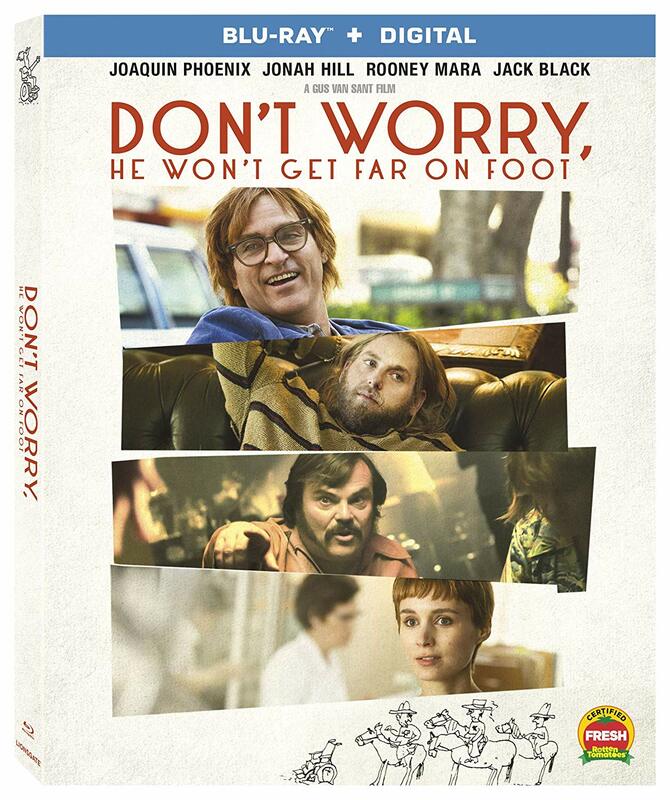 “Don’t Worry, He Won’t Get Far on Foot” (2018, Lionsgate) The performances are the key appeal of Gus Van Sant‘s scattershot biopic of mordantly funny cartoonist John Callahan. Rendered quadriplegic in a DUI accident, Callahan (played by Joaquin Phoenix) – a diehard alcoholic before and after his injury – pursues with the help of a 12-step program while channeling his struggles into his cartoons, which puncture stereotypes of disability and addiction. The script hits a number of recovery story tropes and as such, is less interesting than the people he meets on the Road to Happy Destiny; these include Jonah Hill as a blissed-out support group leader, Jack Black as Callahan’s early partner in chaos, and at various times, Carrie Brownstein, Kim Gordon, Beth Ditto, and the ever-welcome, ever-freaky Udo Kier. Lionsgate’s Blu-ray includes two making-of featurettes. 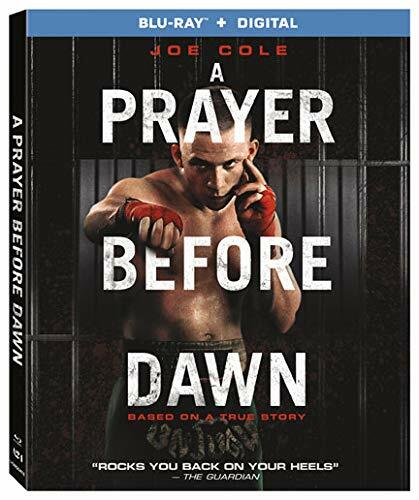 “A Prayer Before Dawn” (2017, Lionsgate) Punishing true story about Billy Moore, a British boxer whose addiction to heroin landed him in a Thai prison that could be politely described as Hell on Earth. 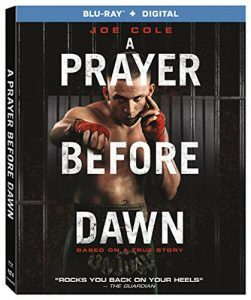 Director Jean-Stephane Sauvaire spares no quarter in depicting the daily brutality of Moore’s existence behind bars; he’s aided immeasurably by UK actor Joe Cole, who immerses himself in Moore’s downward spiral, the intense physicality of his salvation through Muay Thai boxing and a slow stumble towards redemption. Not a pleasant viewing experience by any means, but one devoid of heavy-handed moralization or crude exploitation; Lionsgate’s Blu-ray includes a making-of featurette and a brief interview with the real Moore. “A Happening of Monumental Proportions” (2017, Lionsgate) Ensemble cast comedy traces the arc of a truly miserable day for parents, administrators and associated individuals at an elementary school. “Monumental” is an appropriate term for the scope of this directorial debut by the well-loved character actress Judy Greer, who employs a sizable cast of uniformly solid players to embody her hard-luck cases, including Common, Allison Janney, Bradley Whitford, Jennifer Garner, Rob Riggle, John Cho and in brief turns, Kumail Nanjiani, Katie Holmes, Greer’s “Descendants” scribe Nat Faxon and an amusingly stern Keanu Reeves. Unfortunately, the script by actor Gary Lundy gives them little to do beyond embodying various states of dismay or depression, which upends any goodwill generated by Greer and her players. Lionsgate’s DVD includes a brief making-of featurette. “The Third Murder” (2017, Film Movement) Lawyer Masaharu Fukuyama is handed what seems like a clearly defined case – a man (Koji Yashuko from “Oh Lucy!”) with a history of violence has bludgeoned his employer – but soon finds himself caught between the facts – particularly those offered by the victim’s widow (Yuki Saito) and daughter (Suzu Hirose), which differ from and alter Yashuko’s previous testimony – and his need to fit the crime within the rigid parameters of the justice system. 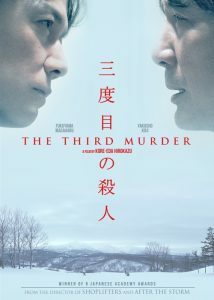 Award-winning drama by writer/director Hirokazu Kore-eda (“After the Storm“) is at times glacially paced and obtuse in its observations about truth and perception, but the complex performances in “Murder,” especially by Fukuyama and Hirose, will be the the primary draw; Film Movement’s Blu-ray bundles the film with “A Gentle Night” (2017), a short from Chinese director Qui Yang about a mother’s search for her missing daughter that earned the Palm d’Or at Cannes that year, as well as cast interviews and a making-of doc. 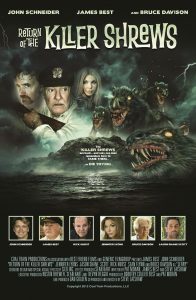 “Return of the Killer Shrews” (2012, VOD/Amazon/Google) A half-century-plus after battling genetically mutated monster shrews, boat captain James Best (serving as star and co-writer) agrees to ferry a reality television crew to the barren island where the ravenous creatures lived and still run amuck. Long-gestating sequel to the well-loved and completely absurd “Killer Shrews” (1959) is essentially a lateral experience: Best must again rescue a mixed bag of nitwits from the shrews, which are conceived with the worst possible effects (atrocious CGI here instead of dogs in bathmats). 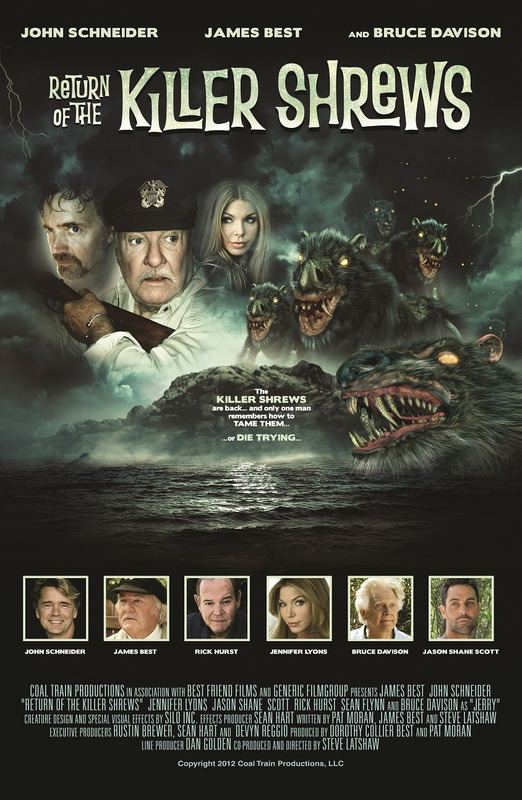 But both are also fast-paced, Big Dumb Fun for no-budget monster movie devotees, though “Return” can claim in its cast not only Best (who died in 2015) but also his “Dukes of Hazzard” co-stars John Schneider and Rick Hurst, and Bruce Davison (“Willard“) as the shrews’ demented keeper. Paul Gaita lives in Sherman Oaks, California with his lovely wife and daughter. He has written for The Los Angeles Times, LA Weekly, Variety and The Fix, among many other publications, and was a home video reviewer for Amazon.com from 1998 to 2014. He has interviewed countless entertainment figures from both the A and Z lists, but his favorites remain Elmore Leonard, Ray Bradbury and George Newall, who created both Schoolhouse Rock and the Hai Karate aftershave commercials. He once shared a Thanksgiving dinner with celebrity astrologer Joyce Jillson, and regrettably, still owes the late character actor Charles Napier a dollar. This entry was posted in Movies and tagged Film Movement, Lionsgate, Return of the Killer Shrews. Bookmark the permalink.